You didn’t know Alabama had beaches? You’re not alone. Yet, it’s no secret to the generations of Southerners that have piled into the family wagon each summer for their beach vacation. 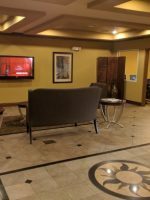 Ninety-percent of visitors to Alabama’s beautiful beaches drive here, and for budget-minded families, especially those with a dog, the Staybridge Suites Gulf Shores is a good hotel choice. 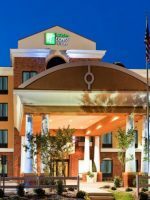 Free amenities include a hot breakfast, Wi-Fi, complimentary laundry facilities, DVD’s, board games, an exercise room, pool, basketball court, outdoor grill and a warm welcome for Fido. If you’re okay with being a few miles from the beach — four to be exact — you’ll find the Staybridge Suites Gulf Shores has a lot to offer families on a budget. You’ll definitely need a car when you visit, however, as most popular attractions, such as the Gulf Coast Zoo, Gulf State Park and The Wharf (which has the Southeast’s largest Ferris wheel), are not within walking distance of the hotel. Suites either come in studio form or have one or two bedrooms, and all come with a full kitchen, though you probably won’t have to cook much since the hotel offers free meals (think of them as family-friendly happy hours) on Tuesday, Wednesday and Thursday nights. On Wednesdays specifically, the hotel offers a full barbecue on the grill out by the pool, which is a fun way for families to meet other guests. Families traveling with a dog will appreciate the many pet-friendly amenities, too. From the welcome doggie bag at check-in (bandana, chew toy and list of pet-friendly al-fresco restaurants) to the gated outdoor dog run and jar of dog biscuits at the front desk, the Staybridge Suites makes your pet feel like royalty. A staff member will even take your dog out every few hours for a walk while you’re gone. It’s not an exaggeration to say this hotel has gone to the dogs either — nearly half of the guests bring their pets along. 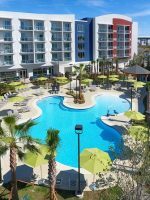 And although Staybridge Suites Gulf Shores provides plenty of canine comforts, it works hard to please guests without pets, too. 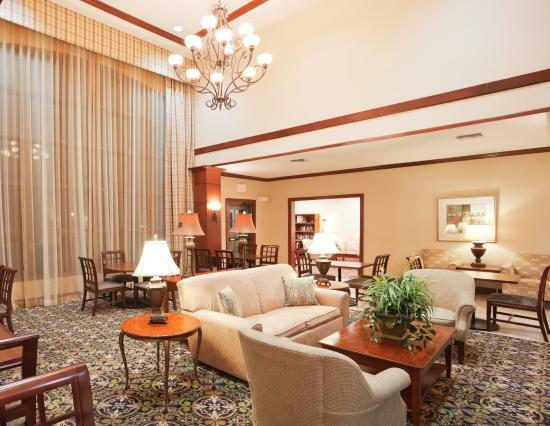 Many guests come to the hotel for extended stays, whether for business or simple because they're retired snowbirds. And it's because the all-suite hotel has many comforts of home. All 88 rooms come with a full kitchen, including a two-burner stove, full-size refrigerator, microwave and dishwasher, toaster, coffeemaker, place settings and cooking utensils. The hotel has Studio, One-Bedroom and Two-Bedroom Suites. Each room has a sitting area/living room with a work area and oversized desk, pull-out sofa bed and flat-screen, 32-inch TV with cable channels and a DVD player. The hotel provides complimentary DVD's for guests, including kid-friendly choices. Studio Suites have one queen bed and can fit two adults and two children on the sofa bed. One-Bedroom Suites have either one king or two double beds, along with the sofa bed. One-Bedroom Suites fit the same number of people as Studios, but the closable bedroom gives parents a little more privacy, along with the larger king size bed. 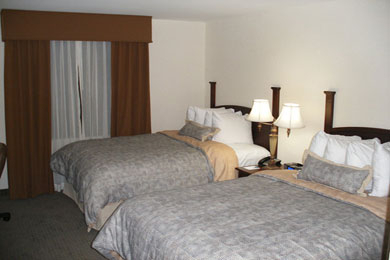 Two-Bedroom Suites have a bedroom with one king bed and another bedroom with two double beds. These suites also have two full bathrooms. All bathrooms in the hotel feature separate bathroom facilities and a vanity, a nice convenience for families. Bathrooms all have a bathtub and shower, too. The hotel does not provide connecting rooms, however. Complimentary cribs and rollaway beds can also be added to any room to fit an additional child. This location checks all the boxes for cleanliness, food service, rest and recreation, laundry services, gym, room sizes, reasonable pricing etc. It may be a few dollars more but check the reviews and stay here with confidence. We did and would return again. We were here 5 nights for Spring Break and to explore purchasing a vacation home in the area. The first day caused confusion with housekeeping, that turned out to be my mistake. I apologized to the cleaning crew. I went to the "older" gentleman on desk duty to apologize, and he never looked up to acknowledge my presence. The rest of the stay, I chose NOT to have room cleaning as it only included throwing covers over bed and emptying the trash. I only requested towels. It was disappointing to arrive and find out that the "heated" pool had been shut off until next winter, which allowed hardly any enjoyment in the pool. The water was freezing cold because the temperature in the city was unusually below average. I wished that the hotel would wait until April 1st to shut off heated pool. This hotel caters to animals traveling with guests, to include doggie treats at check in desk. I'm not fond of animals in hotels, but I wasn't bothered by any until a guest checked in with a brown lab, who looked like he was about to take the burger off of my plate!! The owner apologized later,but it didn't change my opinion of animals in hotels. Once on the elevator during our stay, tracks of dog poop was obviously visible. I called to the front desk that it needed attention. Also, dog poop was outside the building where guests didn't bother to pick up. The M-W light dinner was a plus and saves money for families, especially those traveling with children. The breakfast was typical hotel breakfast with the powder eggs. I didn't see grits or hot chocolate available any of the days we were there. Special kudos to AJ or EJ, the young man working during the breakfast hours. He was extremely helpful and accommodating to all guests. The same welcoming spirit was that of the young man with long hair, and works at the desk. He went out of his way to make our visit comfortable. 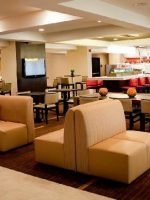 The hotel is conveniently located to restaurants, movies, entertainment, and of course, the beautiful, white sand beaches. The hotel has an outdoor, heated pool, surrounded by a simple area that isn't landscaped. There is plenty of shaded, outdoor seating with a grill, fireplace and beanbag toss game right next to the pool. The enclosed dog run is also next to the pool, allowing families to bring their dog down to the pool area without bothering other guests. There's a basketball court near the pool, as well. 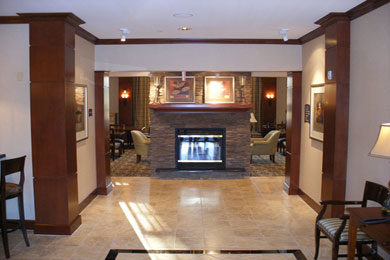 There's a nice multi-purpose room in the lobby with a large stone fireplace and 60-inch flat-screen TV. Directly next to it is another large room that serves as a library/game room, with a good selection of complimentary DVD's, including a few kid-friendly movies. This room also has a TV, giving larger families additional space to relax in the hotel. Thirty-two miles of white powder soft sand beaches are about 15 minutes from the hotel by car. You can rent beach chairs and umbrellas for a few dollars or bring your own. 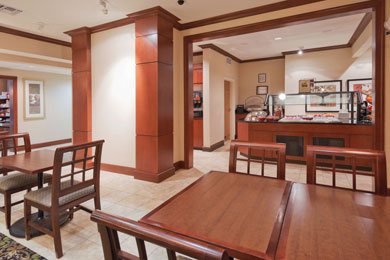 The Staybridge Suites Gulf Shores does not have its own restaurant, but it does provide a complimentary daily hot breakfast buffet, as well as light fare (think fruit and cheese plates) and drinks on Tuesdays, Wednesdays and Thursdays during its social hour -- a family-friendly happy hour reception that also includes beer and wine. On Wednesdays, social hour is a full dinner with a staff barbecue at the outdoor grill by the pool. The hot breakfast buffet includes eggs and bacon or sausage, a waffle station, cereal, danishes, bagels, fresh fruit, coffee and juice. The hot menu items change daily and will sometimes include items like breakfast burritos. A 24-hour gift shop sells snacks, frozen microwavable entrees and ice creams, as well as things you may have forgotten, like toothpaste, contact lens solution and aspirin. If you do travel with man's best friend, there's a $75 pet fee for a stay of up to six nights and $150 for stays of more than a week. The small 24-hour fitness center has treadmills, an exercise bike, elliptical machines and free weights. It's conveniently located next to the complimentary laundry facility and overlooks both the pool and dog run. 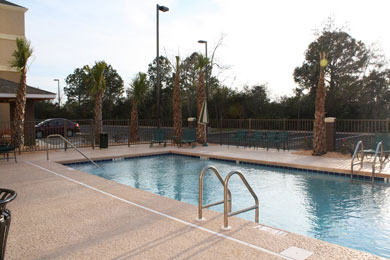 There are complimentary washers and dryers in the laundry room, located next to the pool, dog run and fitness center. Detergent is available for purchase in the hotel's gift shop. 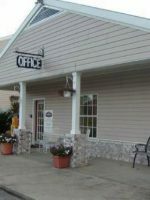 The hotel features complimentary Wi-Fi, and the 24-hour business center provides guests with free access to computers, a printer, scanner, copier and fax machine. The Pantry is the hotel's small 24-hour shop, carrying forgotten items like toothpaste, contact lens solution and razors, as well as microwavable meals, snacks and ice cream. Summer and spring break are high season along Alabama's Gulf Coast beaches. Be aware that spring break brings carloads of college kids. Also note that water temperatures in the Gulf just start to warm up by the end of April or beginning of May. Mild temperatures throughout the winter bring plenty of older snowbirds down south to play golf on the area's many courses, when highs are usually in the 50's and low 60's. Autumn is a lovely time to visit, as the coastal waters are still warm and there are far fewer tourists. The only thing to keep on your planning radar in autumn is the risk of hurricanes. About 90 percent of the visitors to Gulf Shores drive there. Most visitors come from the Southeast and Texas. For those coming from further away, two small airports are about an hour from Gulf Shores, Ala. -- Pensacola International Airport is one hour east of Gulf Shores in Florida and Mobile Regional Airport is a little more than an hour's drive. There is nothing within walking distance of the hotel, so it's necessary to have a car. Parking at the hotel is complimentary. Looking for a romantic evening? The area has several waterfront restaurants offering up sublime seafood fresh from the Gulf of Mexico. You wouldn't normally think dining at a picnic table would be romantic, but add roses and a breathtaking view of the Gulf of Mexico and you've got a perfect date night. The Gulf Restaurant isn't your typical beach shack. Yes, you can admire boats sailing by in a laid-back atmosphere, toes in the sand, drink in hand, but menu items like arugula with grilled shrimp and ceviche make it a unique dining experience. Other great date night waterfront restaurants are the more upscale Cayman Grill and Fishers Dockside.